According to the usual RIAA report CD sales in the US are quickly going down. 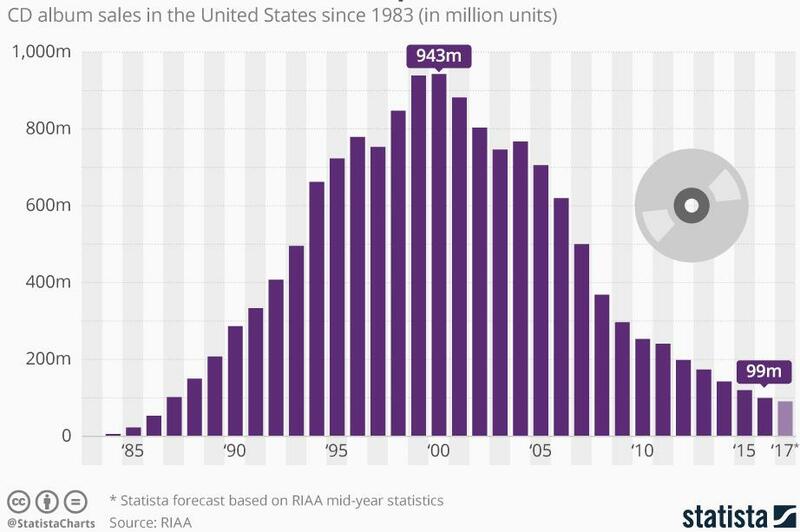 After peaking at 943 million units sold in 2000, there's been a whopping 90 percent drop and now they are at their lowest level since 1987 (99 million units). Streaming music and vinyl sales are increasing at a steady pace, instead. Now, starting on July 1, 2018 Best Buy, an American multinational consumer electronics corporation, will stop selling CDs. This might be the death blow to CD but, in turn, it could help vinyl sales. Indeed, many audiophiles still prefer to own a physical copy of their albums, instead of storing thousands of anonymous music files onto a hard disk. Moreover, LPs might even sound better. Or so they/we say. You might think there are just two reasons left why one should buy CDs: they cost almost nothing nowadays and they do sound better than MP3 streaming services. And you're right. But there might be another reason: CDs sometimes sound better than those “claimed” to be high resolution music files. I've compared several albums and found that remastered high resolution tracks - which you can easily download from anywhere - sound weird when compared to the original CD. There might be something wrong happening the conversion process. After all, if the native recording has 16/44 resolution, you can't improve on that. Upsampling and remastering techniques, if wrongly applied, might deeply affect the sound of the recording. Hence, even if old-fashioned, CDs sometimes sound better than music files and cost almost nothing. Two good reasons for adding a particular title to our collection! CD is dead, long live CD!